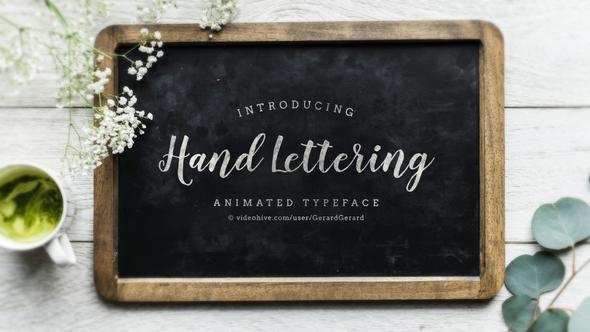 Hand Lettering is a write on animated typeface for After Effects that can be used for titles, intros, openers, lower thirds, quotes or captions. Just install the included script, type in anything, and in one click the script automatically animates the handwritten calligraphy font into the timeline. No need to drag and drop individual letters or manually animate each word. Easy to use controls allow you to adjust the writing speed from slow (60fps) to very fast. Custom controls allow you to add a texture and adjust color and size. Great for wedding titles, romantic wedding openers, animated greeting cards, and animated holiday cards. Music and background photos and videos not included.